The date has been identified from the inscription on the back of The Christ enthroned in majesty, the central icon of the Deesis tier. 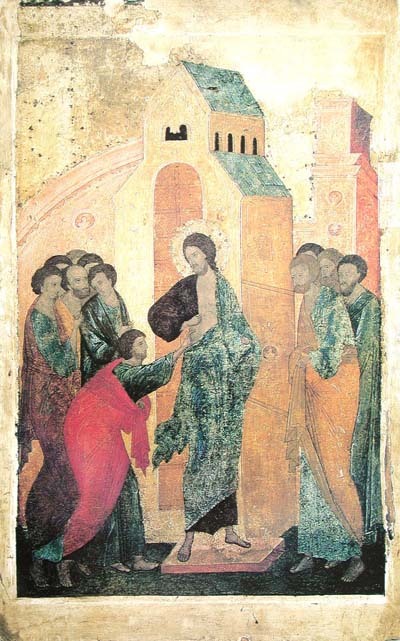 It states that in the year 1500 Dionisy painted the icons for the Deesis, feast and prophet tiers. Распятие не обретает открытого трагизма скорбного сюжета. В изящном изгибе тело Христа предстаёт в идеальном свете, уже далёком от мирской суеты. Аристократически утончённые фигуры, окружающие распятие, создают кристально чистую композицию "совершенной реальности". Слева предстоят Богородица с тремя св. жёнами, справа - св. Иоанн Богослов и Лонгин Сотник, уверовавший в Спасителя. Над перекладиной парят 2 ангела. Под перекладиной слева - Новозаветная церковь, сопровождаемая ангелом, справа - Старозаветная церковь, изгоняемая ангелом. На верхней перекладине креста надпись красными буквами: Ц[А]РЬ СЛАВЫ. Jesus is the central figure. This is emphasized by his placement in the picture plane, by the coloring of His flesh, garment, and the cross, and the fact that all the other figures are in some way responding to His presence. The elongated nature of Dionysius' figures also adds emphasis to the central position of Jesus. With arms wide open, He is shown as the willing sacrifice for humankind's sins and seems to be welcoming all to come and partake of the new life He is purchasing for all by His death. Above Him are two angels and below Him four. In the foreground are two clusters of people who are significantly contrasted with Jesus by the varied colors of their clothing. Virgin stands to the left with a halo distinguishing Her. Behind the Virgin are the three holy women. On the right-hand side are St John the Baptist and the Centurion Longinus. The eyes of all of the human witnesses are either on Jesus or lowered in contemplation and mourning. The highlighted folds of drapery give depth and a degree of movement to the earthly figures, which makes them contrast with Jesus even more. To the right is another mourner, with head uncovered, and the centurion Longinus. His armor makes him stand out from the rest of the figures and his fixed gaze is a testimony to the compelling sacrifice of Jesus. Доска, врезные шпонки поздние, верхняя сквозная. The left-hand margin has been sawn off. Berlin, Cologne, Hamburg, Frankfort on the Main, 1929. In 1914 B. Eding acqured the icon on a trip to the Nothern Russia.